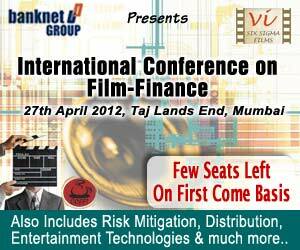 Banknet Group & Six Sigma Films have announced “Conversations on Finance & Film Industry” (COFFI) - A Conference on Film- Financing, Risk Mitigation & Distribution to be organized at Mumbai on 27th April 2012. For the first time in India, Banking, Finance and Entertainment industry will come together on a neutral platform to share their knowledge, experiences & expectations to create a roadmap for working closely in the future. It will help in bridging the spaces between entertainment & finance industry. According to Mr Anurag Khanna, Founder & Chairman & MD of Banknet Group/Six Sigma Films, the main goal of COFFI is to educate equity and debt financiers on film business opportunities while mitigating risks; provide producers with effective approaches to fundraising, and offer participants several ways to create viable content and distribution options to generate revenue. COFFI will bring together media and entertainment industry players with private and public investors to work together to profit in this era of uncertainty. It will provide networking & business opportunities between filmmakers & investors globally. COFFI will have specialized sessions with presentations & interactive panel discussions on various issues like: The Film Financing; Monetization of scripts – Green Lite; Trends in films; Understanding the cash flow in film projects; Film Insurance; Managing Risks; Savings and Finance; Understanding distribution network and Target audience distribution. Further it will help in understanding financing projects and In Film Branding importance, financing small budget and big budget films, pitching process for films or other projects and monetizing 3D in India. COFFI aims to establish itself as a important industry forum for conferences & related activities on Film- financing, risk mitigation & distribution.